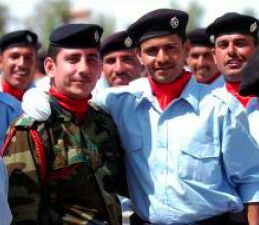 There are an interesting variety of stories, from the opening of a most colorful bridge to Sons of Iraq graduating as Iraqi Police. There are wonderful pictures showing much pride. Terrorists and criminals removed from the streets, and large weapons caches seized. BAGHDAD – May 14, in Baghdad, ISOF detained 2 individuals including a cell leader for ISI, a front organization for AQI. The men are suspected of conducting indirect fire attacks against Victory Base Complex and IED attacks against Baghdad International Airport and SoI. In Mosul, ISOF conducted ops that led to the detaining of 2 suspected IED cell members who are reportedly responsible for IED attacks against the IA and sectarian violence. cordoned off the suspected building. Criminals attacked the Soldiers with small-arms fire, but were driven off by MND-B Soldiers returning fire. Soldiers from another platoon rushed to the scene to provide additional security. The search op continued and a cache including 2 EFPs, 4 mortar tubes, 6 mortar rounds, 3 RPG launchers, 14 RPG rounds and numerous armor piercing rounds, 4 sniper rifles, an RPK machine gun, various IED making materials, 3 grenades, and a vehicle modified for a sniper to fire from unobserved were found. The vehicle also contained one of the EFPs. BAGHDAD – During the early morning hours May 16, conducting intel-driven point ops against pre-identified targets, soldiers from 1st BCT, 4th ID, detained 2 individuals suspected of coordinating and carrying out violent crimes in the Rashid district of southern Baghdad. neighborhood of West Rashid to soldiers of 4th Bn, 64th AR. FOB KALSU – Brightly painted flowers, hearts and polka-dots color the new bridge with cheery symbols. Most importantly, the bridge’s construction between the communities of Busayefi and Hawr Rajab paints a symbol of unity. Once under the control of insurgents, the communities became isolated; they were also separated from each other by the Mercedes Canal. Thanks to the efforts of CF, IA and citizens tired of violence, the insurgents were driven away. However, the canal still isolated them from one another. 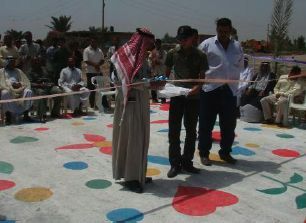 Their desire to establish a relationship materialized May 13 when the bridge linking the communities officially opened. The event was coordinated by Wasmey Khudhayer, owner of the Adwa al-Ashar Construction Co. Besides having an Iraqi co. perform the construction, the project was funded by the GoI. “It’s an important sign that the GoI is footing the bill to reunite their communities,” said Maj. John Brock, 2nd BCT, 3rd ID. Once the event was over, the crowd moved to the Busayefi SoI headquarters for lunch, where they discussed the importance of working together to prevent the criminal activity that once caused division in the area. Sheikh Salah (left), a prominent sheikh in Busayefi, cuts the ribbon. FOB FALCON – At approx. 2:30 a.m. May 15, in the Rashid district of southern Baghdad, Soldiers from Co A, 1st Bn, 22nd Inf Regt, 1st BCT, 4th ID, conducted a point-specific op to detain a suspected Special Groups criminal wanted in connection with extra-judicial killings, IED attacks and weapons trafficking. BAGHDAD – During nighttime ops in the Shula area in northwest Baghdad, May 15, Soldiers from 2nd BCT, 101st Abn Div (AASLT), were attacked by criminals using RPGs and small-arms fire, returned fire and killed 1. An AWT engaged and killed 3 criminals with a Hellfire missile after witnessing a small-arms fire attack. At approx. 11:15 p.m., Soldiers defended themselves and shot and killed 2 more criminals who attacked with small-arms fire. 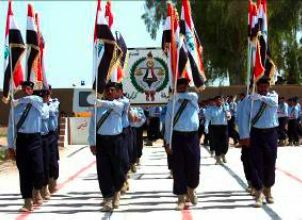 training at the Kirkuk Police Academy, during a graduation ceremony May 15. “The province has shown tremendous progress in the last year. Events like this prove we are taking the necessary steps to show the world this province will stand together to defeat terrorists and establish rule of law,” Col. David Paschal, 1st Bde, 10th Mtn Div told the graduating class. Lt. Col. Christopher Vanek is the cmdr. of the 1st Bn, 87th Inf Regt whose area of op covers the Hawijah District, which has an SOI program with more than 7,500 members. The new recruits will be returning to fill IP vacancies within the Hawijah District, therefore, filling a critical need for police there. For many, this milestone is the direct result of the security gains in the region, specifically in Hawijah, which has seen over an 80 percent drop in violent attacks against its citizens and their SF including the CF, since December’s inception of the SOI program there, according to Paschal. As to how the predominantly Sunni-Arab graduating class felt about their multi-ethnic environment at the academy, whose instructors are comprised of Kurdish, Turkman, Christian, and Arab ethnicities. 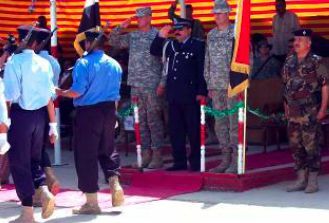 Kirkuk Provincial Police Chief Maj. Gen. Bakr, Col. David Paschal, 1st Bde, 10th Mtn. Div., and Kirkuk Police Academy Cmdr. Abdul-Rahman. Former SoI prepare to pass in review. 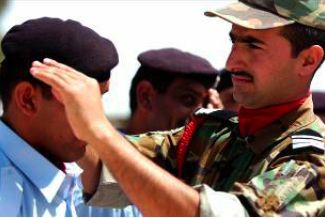 A Kirkuk Police Academy instructor straightens the beret of one of the 318 IP recruits prior to their graduation ceremony. Kirkuk Police Academy recruits pose with their instructor prior to their graduation ceremony. BAGHDAD – A joint route recon mission in Maderiyah led to the discovery of 6 separate weapons caches May 13, to include 300 anti-personnel grenades. The first cache contained a 120 mm mortar round, a 100 mm anti-aircraft round, 12 RPG warheads, 8 73 mm rockets and a mortar tripod. All weapons were serviceable and the rockets were still in their plastic containers. The second cache recovered consisted of 300 anti-personnel grenades, 100 meters of detonation cord, 100 rounds of PKC machine-gun ammo and 5 sticks of TNT. “Most of the 300 anti-personnel grenades were serviceable. Because they were found with detonation cord, these most likely would have been used to booby trap homes or areas where AQI expected U.S. or IA soldiers to search,” said Capt. Richard Aaron, a Btry cmdr. with 2nd BCT, 3rd ID. Acting on intel provided by area residents, Soldiers from 2nd BCT, 3rd ID, and IA soldiers conducted the mission to investigate the reported cache sites. Local SoI were on hand during the mission as well. The final caches were discovered in close proximity to each other, consisting of a 23 mm antiaircraft gun with a tripod, 200 23 mm rounds, an SS-30 M3 127 mm rocket and 3 120 mm mortars, all of which were serviceable. Many of the munitions were in new condition, indicating they were recently placed in the area, and done so with care. Weapons found in water were well-protected, Aaron said.